If your Reputation is lower than 3 you will be attacked by groups of three Flaming Fist Enforcers, a Flaming Fist Scout and a Flaming Fist Battle Wizard. The Flaming Fist will attack suddenly both on the streets and in the Blade and Stars. Enter the house AR0813. You can only talk to Nemphre with a male adventurer from your party. She wants you to retrieve an amulet from Arkion. 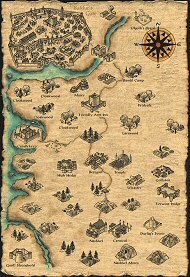 Head to E Baldur's Gate. Return once you have the item. You can attack her afterwards without penalty. Ensure you collect her Onyx Ring and Arkion's Bloodstone Amulet from her body to give to Ordulinian in E Baldur's Gate. Raid the two bedside tables, the bookcases and cupboard. Talk to the Storekeep. He sells potions. Raid the sack and three shelves. Enter the house AR1316. You will interrupt Taxek and Michael mid-burglary. You can let them go, act the policeman in which case they will attack, or say "You broke into...", "No easy way..." options 1, 2 and they will give you their gold before fleeing. Raid the cupboard and bookcase. Raid the drawers and cupboard. Enter the Inn AR1306. Talk to Euric and give him the amulet. Return to Nadine in Central Baldur's Gate. Raid the keg in the back room. Raid the locked drawers in Room 204 (clockwise from stairs). Raid the desk, two locked chests, two crates, two barrels and a keg. Raid the two bookcases and the drawers. Enter the warehouse AR1303. Talk to Nadarin. You cannot get the quest if your NPC Reaction is 1-7. 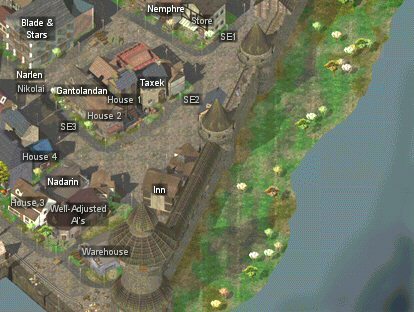 There is a Greater Basilisk loose at the Baldur's Gate Docks. Head to the Docks. Return to Nadarin once you have killed it. Raid the locked chest and three barrels. Raid the bedside table and the drawers. If you talk to Nikolai he offers a history of Baldur's Gate for 15gp. Leave everyone except your designated thief where you entered. Send the thief to the Blade and Stars to meet Narlen. Follow him to Gantolandan's house. Enter the house AR1312 and go up to the 2nd floor AR1313. Raid the trapped drawers and steal the Rogue Stone. As you do so Gantolandan will ask who's there. Impersonate a cat, then when questioned again say you're a stray. If he wakes up you can kill him. Return to the Thieves' Guild in E Baldur's Gate with the stone. Raid the locked chest and two bookcases. Enter the Blade and Stars AR0105. Talk to G'axir. If you are less than Level 4 you cannot get his quest. He wants a Sphene Gem to tell you your fortune. If you don't have one then complete the Nadarin sidequest. Talk to him and he will read your fortune. There is nothing to steal on the 2nd AR0106 or 3rd floors AR0107. Enter the Blade and Stars AR0105. Go upstairs AR0106. Talk to Lothander and give him the scroll. He will give you his half of the antidote. The other half is with Marek in the Blushing Mermaid in NE Baldur's Gate. Enter the Blade and Stars AR0105. Talk to Elkart with Eldoth and Skie in your party and you can blackmail him for 1000gp. You can return to him every 24 hours a further seven times to collect the blackmail before he calls the Flaming Fist to attack you. Run unless you want to lose reputation points.